Guilds cost 3000 Gold to make, while joining a Guild is completely free. Guilds can have up to 50 members, and can be set as Open, Request Only, or Private. Guilds can have their region set in the settings or upon creation. This does not affect any in-game options, but functions as a search criteria for other players. Users can search for guilds based on their name, region, and member count. Guilds will have custom emblems that you can make from preset backgrounds and icons, which will show up underneath your username along with the guild name in the match introduction and post-game screen. Your guild banner will also display on the Leaderboard. Guilds have their own private chat room that can’t be accessed by people who aren’t members of the Guild. Users in a guild have three different ranks: Member, Officer, and Leader. Officers gain the ability to kick Members from the Guild. Leaders can kick Members from the Guild, as well as change the Guild’s Icon, Description, Region, Application Status, and Promote or Demote other members of the Guild. The Leader can promote an Officer to become Leader of the Guild, at which point they will become an Officer. Any Guild Member can create an open invitation for a match with fellow Guild Members by clicking the Guild Lobby button, located next to the chat window. You can select between 2v2 Premades, a 2v2 Lobby, Mayhem, and a 1v1 Challenge. 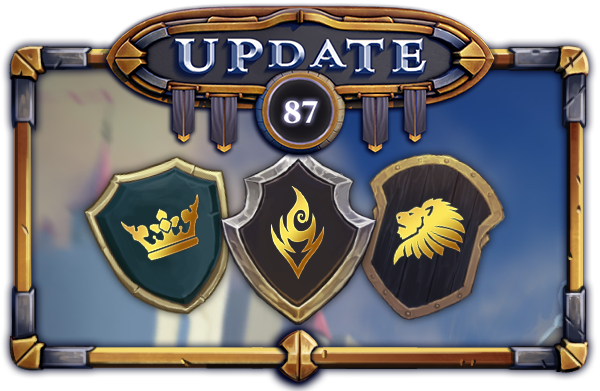 There will be a Special Guild Quest available for a month after the release of Update 87. Win 10 games through Guild 2v2 Premades and you’ll receive 3000 Gold. You'll notice a tab in the menu saying Guild Pass. Yes, a guild-based progression system is coming! We aren't ready to say too much about it yet, but you should get your best allies together and prepare! Important to note is that this is a first iteration of the Guild System. We don’t intend for this to be the final version of the feature, and we have lots of ideas for how to expand upon it in the future. Your feedback will be invaluable in the next few weeks, so make sure to communicate with us about what you like or dislike. Bazooka Scrat has always been the odd one out in terms of anti-building cards, really only ever used for turret disposal. Its applications as a unit that damages the enemy Master tower have always been pretty limited due to its low health pool, and while we don’t want to overbuff that as a result the damage increase should help justify the inclusion of it in a deck. It also makes it best for the immediate removal of those pesky high priority buildings, such as a carelessly placed Scrat Launcher. Crossbow Dudes is a card that has been underperforming since the loss of the third unit. While we have buffed the card in the past we still feel it’s in a fairly weak spot, so we are introducing a minor buff while remaining cautious of how the change might affect other Crossbow Dude cards such as Crossbow Guild, Raging Reinforcements and the likes. Crystal Arcanist, while sounding good on paper, often found herself getting overwhelmed by the very swarm units she was meant to kill due to her slow attacks outside of Mana Surge. It severely limited her capability to deal with swarm cards such as Propeller Horde due to how quickly she could be killed before even getting a single attack off. Crystal Archers have been a very prominent card since their release, and their ability to outrange most masters or even other ranged cards made their overall safety too high for a card that provides glass cannon stats. Reducing the range still makes them have that unique element of being longer range than most units in its class. We chose to reduce the Attack Delay to compensate for this as they have now become a much more defensive unit, especially pre-Mana Surge, so we want to make sure they can still fulfill that purpose. Demon Warrior’s redesign was with the intent of making her a “glass cannon”, having the single highest attack damage in the game once she’s activated. Unfortunately, her health pool was currently a bit too low for her to actually be in a position to dish out that damage offensively, so we feel a small tweak in her Health is necessary. Divine Warrior has been a long-time staple of high level play. Some people loved her, the others wanted immediate changes. The sheer amount of value she provided from the extended capability to block damage made her an invaluable asset on the defense with the amount of time she bought you, allowing you in some cases to generate the amount of mana you spent on her in the time she’s soaking up damage. This rescaling isn’t intended to be a straight nerf to the card, hence why she is being made easier to play in exchange for this reduced defensive capability. Added a new Spotlight rotation on the main menu to replace the Streamer Panel and Event banner. The Spotlight will rotate between current items, such as between the Featured Streamer panel and the current Event. Fixed buildings preventing the placement of Diona’s traps - Thanks Floflorian! Fixed Scrat Tank opening and being trapped by Diona’s bear trap, even if there were no enemies nearby - Thanks BOB! Fixed a bug with the new Glory UI bars not filling completely - Thanks Thehagengnome! Fixed Ruffles still retrieving rewards if he is stunned by Bridge Swap while collecting them - Thanks Datenshi! Fixed an issue where too many expeditions were being shown at once. Fixed a graphical issue with Witch Hunter Ratbo’s attack. Fixed an issue where Werewolf transformations caused the unit’s ragdoll to become a bright colour and stay on the field until the end of the match. Fixed the 2v2 premade timer not appearing. Fixed an AO issue in the victory/defeat screen. notice how its an anonomous user saying to do something in a place that will likely never be seen. KP is not even overpowered and is rather well balanced. learn to play the game properly before bitching thanks. Learn how to counter KP instead of insulting anyone.